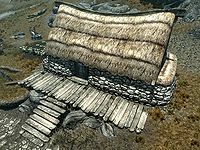 Lemkil's Farmhouse is a small farm in Rorikstead. It is home to the widower Lemkil and his twin daughters, Britte and Sissel, with the former being the older twin. The farmstead is at the eastern end of Rorikstead, along the road that passes through the village. Opposite Cowflop Farmhouse. The three family members make a point of spending as little time together as possible. When they wake at 6am they all leave the house; Lemkil only returns to sleep at 10pm after spending his evenings in the inn, while Sissel spends part of her evening at Rorik's Manor learning magic, returning only to sleep. Britte has nowhere to go, but has the house to herself in the evenings, going to bed at midnight. There is a lavender plant beside the wooden steps that lead up to the entrance. It is a modest single story building, with a small field to the east, where Lemkil grows twenty-five cabbages, eight leeks and thirteen potato plants. The front door is normally locked, with a novice level lock. Upon entering there is a chair and barrels against the northeast wall. Further around against the southwest wall is a cupboard holding clutter and beside this are several more food barrels. There is a long wooden table and bench against the southwest wall. On the table is a flower basket containing two chicken's eggs, a bucket containing three potatoes and a bottle of alto wine. Above the table are three garlic braids, a bunch of frost mirriam and two bunches of elves ear, with a rack hanging to the right holding three rabbits and three pheasants. To the right of the table is a food barrel and a flower basket containing four pine thrush eggs. Beside these is an owned single bed coming out from the southwest wall, where Lemkil sleeps. At the foot of the bed is an unlocked chest containing minor loot. Further along the southwest wall is a fireplace with a cooking pot and table and two chairs in front. On the table is a bottle of alto wine, a couple of loaves of bread and a pine thrush egg. By the hearth is a kettle containing two leeks. At the northwest end of the room are two owned single beds both coming out from the northwest wall where the twins sleep, with an end table between them. On the end table are two sweet rolls and a flute, with a lute leaning against it. To the right, against the southeast wall is a wardrobe containing clothes and to the right a dresser with three garlic braids, two bunches of elves ear and a bunch of frost mirriam hanging from the ceiling above. On the dresser is a bottle of Black-Briar mead, four bulbs of garlic, a bunch of frost mirriam and a bunch of elves ear. The key to the house is carried by all three members of the family. The girls don't always seem to spend much time sleeping.